1. A conversation with my mother this morning. God bless Moms. I might go as Burt Reynolds, just to spite her. 3. Three words. Sidney. Crosby. Naked. Also, ignore the part about Santonio Holmes, because the only adults who haven’t already seen him naked are dead people. I don’t really care if Clark stays or goes, but they better sign Daniel Sepulveda because if the Steelers fail to make the playoffs again, we’re going to need something pretty to look at, damn it! 5. Watch the blog next week for an update on Make Room for Kids. BIG THINGS HAPPENING! 6. Nothing to do with Pittsburgh, everything to do with love. 7. George is shaving his head, too! There are going to be lots of bald Pittsburghers after St. Baldrick’s Day and when you see them, and you find out they shaved their hair for sick kids, you should hug them. Donate to George if you can! 8. Mike has partnered with the Art Institute of Pittsburgh to release some awesome Pittsburgh/Irish shirts for St. Patrick’s Day. The challenge of reinventing the St. Patrick’s Day theme was set before a group of honor students at The Art Institute. The Design Studio class has accepted and excelled at many local design challenges, taking this year’s St. Patrick’s Day in stride. Ultimately the designs from student Lizz Guriel were chosen for production. A portion of the proceeds will benefit The Art Institute of Pittsburgh’s Education Foundation, creating scholarships for students. One more will be rolled out at some point today. If you order $35 or more, you can use code MARCHSALE to take 15% off. 9. In order to purchase beer at the select Giant Eagles that are selling it, you will be required to scan your license into a little card reader, allowing Giant Eagle to collect information on you. This article at Boing Boing explores why that’s an invasion of privacy. Can I just say, when the hell is the PLCB going to treat us like adults and realize that just because we can buy the devil’s brew in a grocery store doesn’t mean we’re going to go nuts and start throwing back six-packs right there in the grocery aisles, filling the store with scent of our beer-flavored belches? That it doesn’t mean we’re going to start sending our children to the grocery store to buy beer? That it doesn’t mean grocery stores are going to look at a 17-year-old and go, “Eh. Good enough.” When will the PLCB realize that almost every other state of the union has beer and wine stores that are privately owned and somehow, by the grace of God, the people of those states continue to function, the state somehow manages to function and doesn’t collapse in upon itself in a giant heap of alcohol-tainted vomit? Oh, God. I’m ranting about the PLCB again. It never ends well. I’m stopping. Pittsburgh Clover shirt goes straight to the top of the awesome mountain! 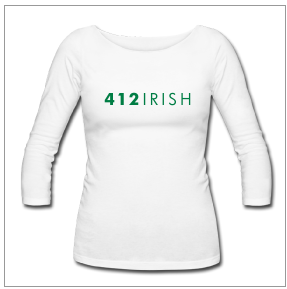 And, just curious…was Ginny the body model for the 412Irish shirt? Looked pretty hot to me! Following the “those in power never voluntarily relinquish it” theorm, the PLCB is here for eternity. Or one hell of a consumer revolution. Just sayin’. One note regarding Giant Eagle and data. If Giant Eagle is collecting the data, it shouldn’t be much of an issue. They cling to their data pretty tightly. If, however, it’s the PLCB that is collecting the data…all bets are off. You’ve clearly never been to the North Side Giant Eagle… And it doesn’t even have a beer counter. so, would that be as “smokey and the bandit” burt reynolds? or, “boogie nights” burt reynolds? orrrr, “the longest yard” (original version) burt reynolds, complete with kickass torn-to-pieces #22 jersey? In regard to #4 about Daniel Sepulveda: AMEN SISTER. That man is smoking hot! Personally, I think he should punt shirtless. Always. Yum-my. 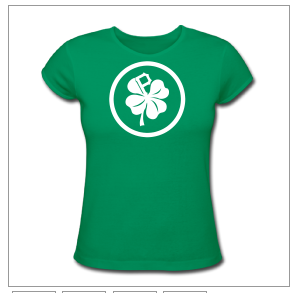 Cute St. Patty’s shirts. Kudos to the talented artists that created the designs. I think I may have to own one…or both. OMan I really have to learn to take your “have the tissues handy” warning to heart. PLCB is all about union jobs and state revenue. Any argument about safety, public health, and underage drinking is unsupported masquerading. My favorite Crosby photoshops are with Mortal Kombat and Pedro Martinez. 1. Wow, that takes me back to my adolescence. I was often told to dress and/or walk like a girl, my poor mom probably despairing that I would ever meet a man to love and marry me, and have babies with. Yeah, look how that turned out. 3. I know this is shocking, but I have actually NOT seen Holmes naked. I never click those links. Hampton was enough, thank you. 6. Yeah. Thanks for the tears. God bless. 8. I like 412irish. Kid sizes? As if my dago husband is going to let me get away with that! hee hee hee! 6… wow.. that was a tough read. You weren’t kidding about the needing tissues part. Thank you for bringing it to my attention. It filled my heart with so much hope and love. My 3rd is coming in 3 weeks, and I know all about that “rollercoaster” of worry, love, dreams of perfection. I am an older mommy this time around, and I am always worried. :)So far, so good. It’s funny, but after reading that blog I feel a lot calmer than I have in past weeks. I think the one thing I will take away from it is that no matter what happens.. unconditional love makes all things perfect in their own way. Totally agree with snifflin – really need to heed the tissues warning as I sat at my desk and cried while I read that. Great story, thanks for sharing! First off, I should have mentioned Sid in my Reebok post. Thank you, Ginny, for calling me out on it. My bad. Second, I have to point out that some of us men take a lot of interest in our suits. Trust me, there are huge difference between a crappy suit that isn’t tailored and one that is. Some men care. Check the shoes…always check the shoes. I meant to say “huge differences”…again, my bad. What PA needs is to do is to allow retail beer (not just a case at a time), wine and liquor and get ride of the PLCB stores. I agree with strick age enforcement but not with a wasteful govt. system that typically provides poor service, higher prices and poor selection. Just try to find a really good wine at most PLCB store – more often than not the staff doesn’t have a clue. Come on PA govt. – let’s join the 20th (let alone the 21st) century. The Commonwealth will never get rid of the State Stores. Do you have any idea how much stuff is funded by the billions of $ the PLCB brings in? We’re all in favor of ditching this outdated system, but until a method to replace that revenue is proposed, it’ll never happen…ever. Thanks so much for number 6. crying…. Last week I was able to drag my husband to the settler’s ridge Market District with the promise of beer. He went to pay for said beer and not having a license was unable to purchase it. Let’s just say he wasn’t very happy. I have never seen a comprehensive report on how much money the state brings in on the non-tax portion of sales vs. the cost of maintaining the stores, staffing, benefits, etc. so I don’t know how much revenue the state stores really actually bring in. Wouldn’t retail establishments provide additional employment (and therefore additional income tax) and revenue (in the form of licensing fees – much like the current pouring licensing) and still collect the state taxes? It is time to end this antiquated system. My bf swears that Daniel Sepulveda is gay. Blasphemy!!! He is just jealous of my love for Daniel. I got his autograph at training camp and several pics from the sidelines of his gorgeous form this summer. I also have yet to find something to wear for the film office party, so I might also find myself at the mall Sunday morning if I can’t get anything tonight. 2. What’s a fine blog like yours doing in a place like Puck Daddy? Please stay away! Wysh (chief editor Greg Wyshinski) panders to the LCD mouth-breather types, and most of the time when he writes about Sid it’s to fan the flames of hate. 3. Ditto red pen mama. Also, I really have no interest in naked Sid unless it means he’s up in my bedroom waiting when I get home from work. Naked-in-an-ad Sid is just a big fat tease. 9. The PLCB is all that is soulless and wrong. @pensgirl, I see your naked Sid, and (because I’m a working mom) raise you: An aproned Sid in my kitchen making me dinner. Now that’s hawt. RPM, I stand corrected. I’m a good cook but hate doing it. One thing I must add: the serving dish is the Stanley Cup. 1. I haven’t been home in almost a year, but if there is one around you that hasn’t closed, try Ann Taylor Loft. They have great dresses that basically involve pulling the thing over your head. You can get away with them being formal by adding good shoes and jewelery. It’s my whole closet. 3. Yes please. And @pensgirl, I’m totally with you. The Stanley Cup needs to be involved somehow. 9. I live in Texas (well, El Paso) now and have lived in Arizona the last two years. In Army towns. Where they sell liquor in the grocery stores. If the kiddos aren’t buying their parents beer here and people aren’t belching in the aisles here, it won’t happen ANYWHERE. The LCD is exactly why I buy ALL my supplies of assorted spirits out of state. Every trip out, and there are a couple a month, is preceded by Email to several people who front cash and get their orders delivered to their homes. Ohio has Trader Joes which sells assorted wines not to be found in PA, and other states have cheaper prices than PA.
My liquor taxes do not fund the lumpfish pols in Harrisburg. What an amazing, amazing story. So many people wouldn’t have been nearly brave enough to admit to all of those emotions, but anyone who says that in the same situation they didn’t feel those same emotions isn’t human. Thanks for the link. re: the PLCB — when I went back to southern VA, where I used to live, a couple of years ago, my friend took me to a local wine store. their selection was of the likes of which I had never seen before. and, I actually had an employee come up to me and ask me if I’d like any wine suggestions. and, he was actually knowledgable. and, they allow you to actually taste test the wine, to see if it’s to your liking before spending the moolah on it. now, the prices might not have been much better — hit or miss. BUT — I was blown away to the point that I make a point to stop by that store every time I’m there. SO — instead of wasting taxpayer money on “how to be nice and humane to our customers” seminars, the PLCB should send every single one of their employees to this wine store in richmond, VA to see how it’s done right. #6 – this has been floating all over Facebook for a month and I’m glad its going around! Two of my friends are mothers of children with Down’s Syndrome (happening at ages 31 and 32) – the older siblings are so awesome to watch, as they truly love unconditionally. We are glad the author shared her honest feelings, especially because they are normal (something my friends struggled with for years, thinking they were evil for being disappointed or for wanting a more ‘normal’ life). #9 Growing up in the 70s, the two great symbols of fascistic state control were our Selective Service cards and our PLCB ID cards. The draft card eventually disappeared for well-documented reasons. But my LCB picture ID is still in my wallet, capturing a moment in time when I had more youth than sense and more hair than most of the Allman Brothers. I still treasure this pre-Photoshop, PLCB invasion of my privacy, where I haven’t aged a day since 1974. But I’m glad I no longer have to purchase spirits in the Commonwealth. Just a FYI: #6 is going to be interviewed by CNN on Connect the World with Becky Anderson.